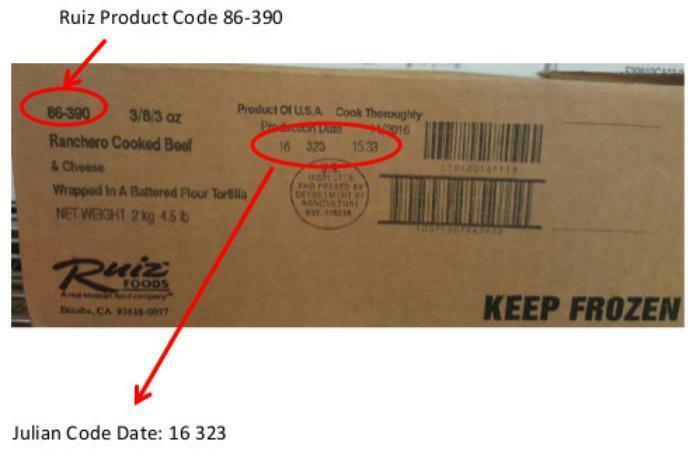 Ruiz Food Products of Denison, Texas, is recalling approximately 23,544 pounds of beef and cheese tortilla products that may be contaminated with extraneous materials -- specifically brittle clear plastic. There have been no confirmed reports of injury or adverse reactions due to consumption of these products. The recalled products bearing establishment number “EST. 17523A” inside the USDA mark of inspection, were shipped to institutions in Arkansas, Illinois, Indiana, Iowa, Kentucky, Maryland, Michigan, North Carolina, Oklahoma, Pennsylvania, Texas and Wisconsin. Consumers who purchased the recalled products should not consume them, but throw them away or return them to the place of purchase. Consumers with questions may contact the Ruiz Foods at (800) 772-6474.